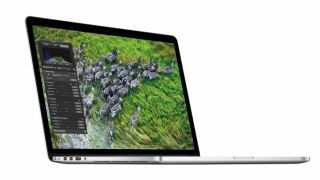 The new MacBook Pro: unbelievable, or unforgivable? Should something so expensive be so un-upgradeable? Whenever I bought a used car, I'd go crazy with the car stereo. I'd rip out and replace the speakers, cut holes in the parcel shelf to make room for more, stick amps under seats and subwoofers wherever they'd fit. I didn't stop because manufacturers started making their stereos in unique shapes, although that was a pain, and I didn't stop because stereos became part of a wider system, integrated with trip computers and phone kits and other odds and sods. I stopped because once the manufacturers started fitting decent stereos, upgrading was no longer necessary. I upgraded the stereos because the factory-fit ones were crap. When they were no longer crap, I stopped upgrading them. I think the new generation MacBook Pro, the one with the retina display, is a bit like that. The standard spec is good enough that you shouldn't need to upgrade, which is just as well, because you can't. Want to upgrade the RAM later on? No can do. Replace the battery? Nope. Repair the trackpad? Uh-uh. According to iFixit, it's "the least repairable laptop we've ever taken apart." If you're in the business of showing people how to repair or upgrade laptops, as iFixit just happens to be, then of course that's bad news. But is it bad news for the rest of us? Are we, as one iFixit commenter suggests, "building our own prison"? There are two key objections to kit you can't easily upgrade or repair. The first is practical and the second is philosophical. Practical first. Having a non-removable battery isn't ideal, because batteries have a finite lifespan: my ageing MacBook Pro's battery went all bulgy a year ago, but the laptop itself is doing just fine. Traditional Apple batteries are pricey enough, so I wouldn't fancy paying Apple prices to replace the kind of battery you see in the new MacBook Pro. It's nice to be able to upgrade the RAM, too, but I'm not sure that's a deal-breaker here: the only time I've had to upgrade laptop RAM is because I under-specced it in the first place to save a few quid. 8GB or 16GB on-board seems future-proof enough for three years. The other thing that's likely to go, the SSD drive, should see third-party options appearing before long. Those are the practical things. What about the philosophical issues? Apple is removing your freedom to tinker, turning the computer into an appliance whose innards are untouchable by mere mortals. That may be true, but laptops were never the most expandable or upgradeable computers in the first place - and the same lack of user-serviceable/upgradeable parts applies to pretty much everything inside and outside my house: my TV, my set-top-box, my Xbox, my central heating, my tablet, my smartphone, my coffee machine, my car. Yes, some of those examples are silly, but the car one is probably the closest: the newer, better and more expensive the car, the less likely you'll be spending your weekends crawling underneath it with a tin of Gun Gum and a Haynes book. When the car goes wrong most of us go to the dealer and pay them to fix it, and if it costs too much to fix we take it into the hills and torch the bugger*. Is the new MacBook Pro the shape of things to come? Maybe, for Apple at least. Should people be worried? Possibly: as a whole bunch of original iPad owners discovered this week with iOS 6, just because it has an Apple logo on it doesn't mean it's future-proof. Is it the end of the world as we know it? Probably not. I think that for most laptop owners, "upgrading" means buying a new one.